After publishing my first personal HoloLens project ‘Typography Insight for HoloLens’ last year, I continued experiments on typography in mixed reality space. One of the most fascinating aspects of HoloLens was the rendering quality of type. Since HoloLens has higher PPD(Pixels Per Degree) than other AR/VR devices, it renders beautiful sharp text. I wanted to create an app that can leverage text rendering quality as well as physical environment. 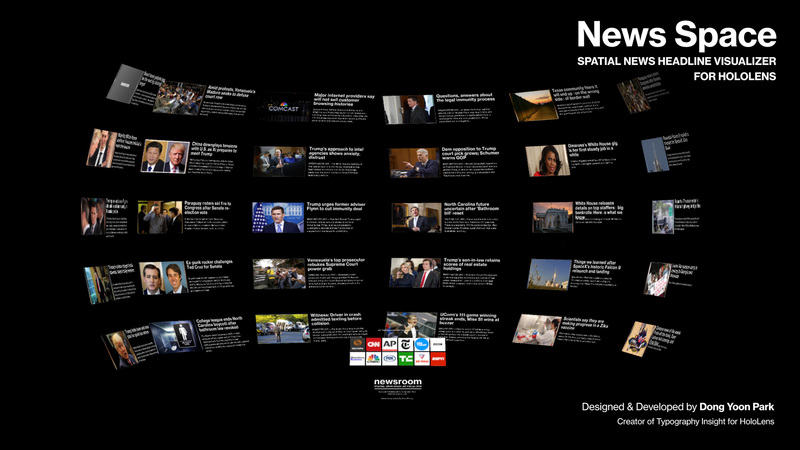 News Space is a spatial news headline visualizer in Mixed Reality space. 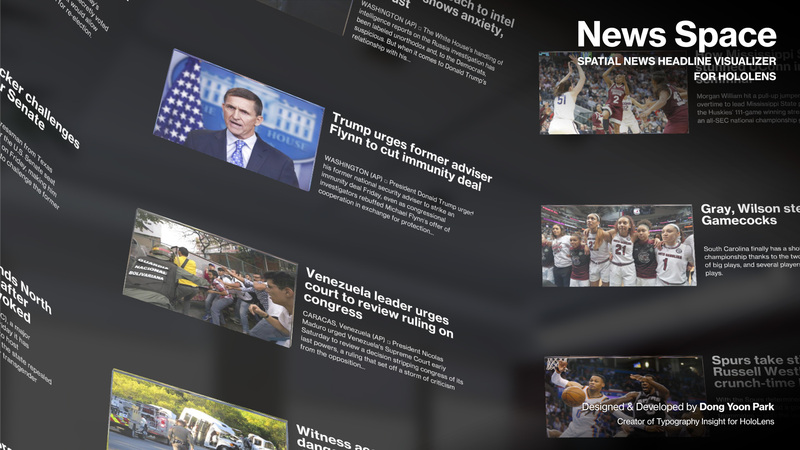 It fills up your room with the latest news headlines. 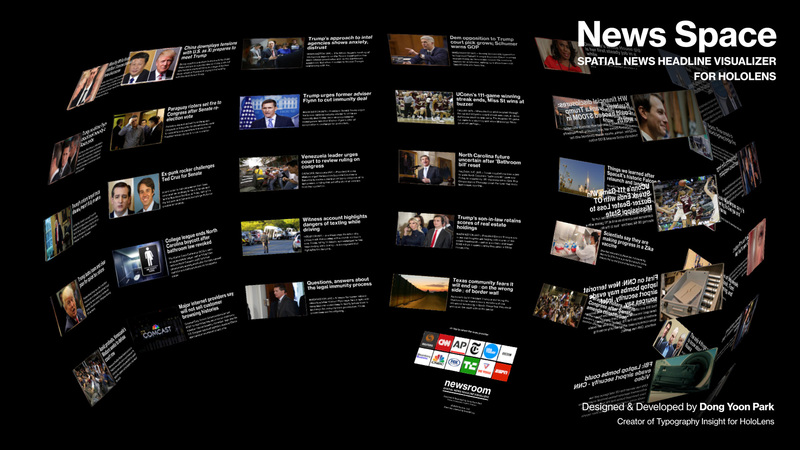 Since the news headlines are world-locked, you can walk around and view the detailed images and summaries. 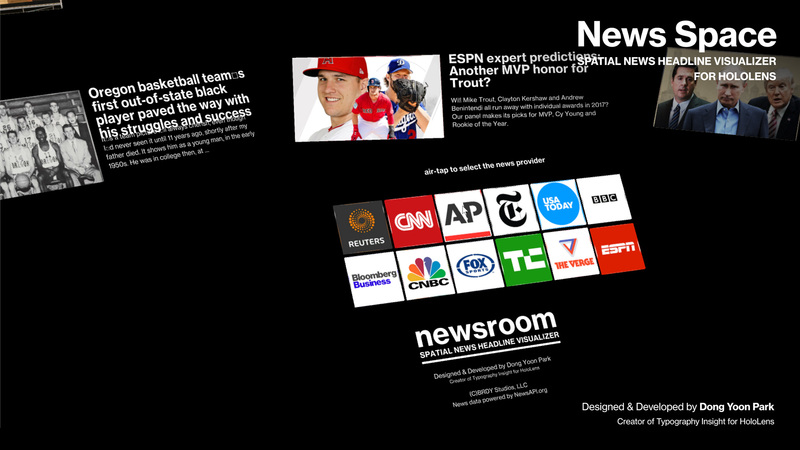 By air-tapping one of the news provider button, you can load headlines from the provider. For the news item layout, instead of using traditional 2D style list on a limited frame, I wanted to use the entire physical environment around the user. 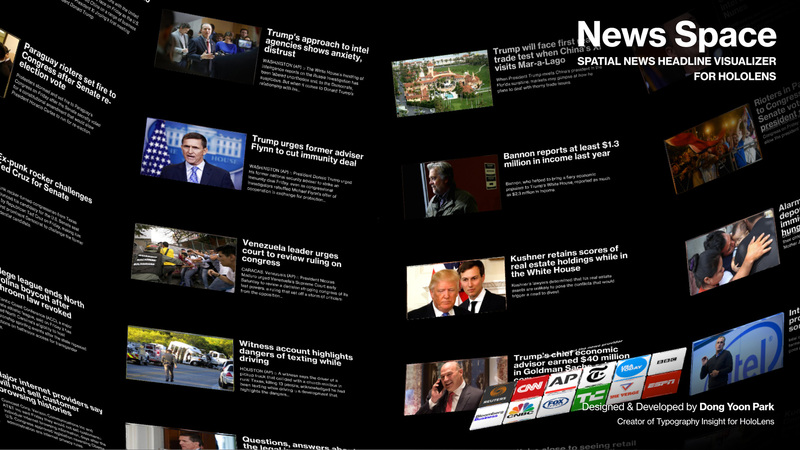 Through the series of experiments with different layout shapes such as three-dimensional list and curved surface, I found that the spherical layout is comfortable since it gives me relatively consistent distance to the news headlines regardless of the viewing angle. The app is free and you can download it from the Store in your HoloLens. *Currently, you should use search box and type ‘news space’ to find the app. – Some of the news summary text’s cropping is not applied correctly. – Loading new data make the app look like stopped/crashed for a few seconds.